Settling our camping arrangements in Yellowstone was one of the first steps we took in planning this trip. Campsites can be booked out so far in advance that it is often hard to get a site, especially to cover several days. We lucked out, and found an available reservation at Canyon Campground, which covered the days we hoped for. The campground is situated in what feels like the middle of the park. It is easy to access almost every area from this hub. The sites are assigned at arrival, so you don’t get to select a site ahead of time. We rolled in around lunch time, parked at the camp office, and went in to get our assigned site. The desk staff are very nice and very informative about the area - also, quick and efficient with getting everything processed. We drove over to our assigned site, which was perfect for a van. There wasn’t much “yard space”, so a tent would not have worked well at this site, but they asked us specifically about our sleeping arrangements, and it worked perfectly for us. We were in a smaller loop, so it was a quiet site, which was nice. We backed right up to the bathroom, but it wasn’t bright or noisy, so more of a convenience than a problem. 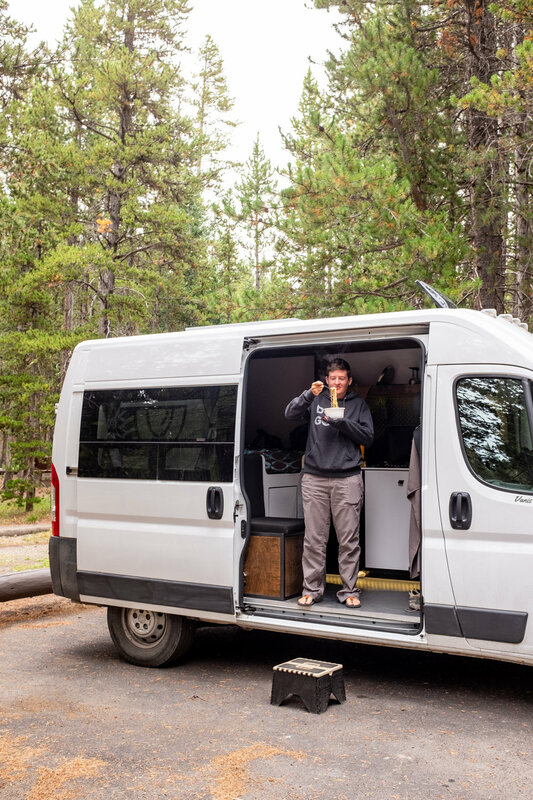 One convenience of van camping, especially in the cooler weather, is that we were well insulated against noise and light! One of the features that we didn’t expect to use, but that came in very handy was the laundry facility. We planned on showering here, especially since the showers were included with the site fee, and were not timed (wahoo!). We didn’t expect to run out of clean cloths, but when we did, $5 got us a load of clean, fresh, dry clothes! Very convenient! The campground is very close to the Canyon retail hub, too. A big visitor center, a gift shop, a lodge, and a little restuarant are within walking distance of the campground. We took advantage of the little diner, which is inside the big gift shop, twice. Hot fries, cold beer (and huckleberry soda!) and a big burger were necessary after a few days of freeze-dried food and cold sandwiches. The food is good, nothing amazing, but totally hit the spot after a day of hiking! On to the real excitement of this area - the “Grand Canyon of Yellowstone”! This area of Yellowstone boasts some amazing geologic history, that shows itself in beautiful colors and scenery. This area is well designed to be carefully explored and enjoyed. There are plenty of overlooks and staircases and amazing views to enjoy the canyon and falls from. 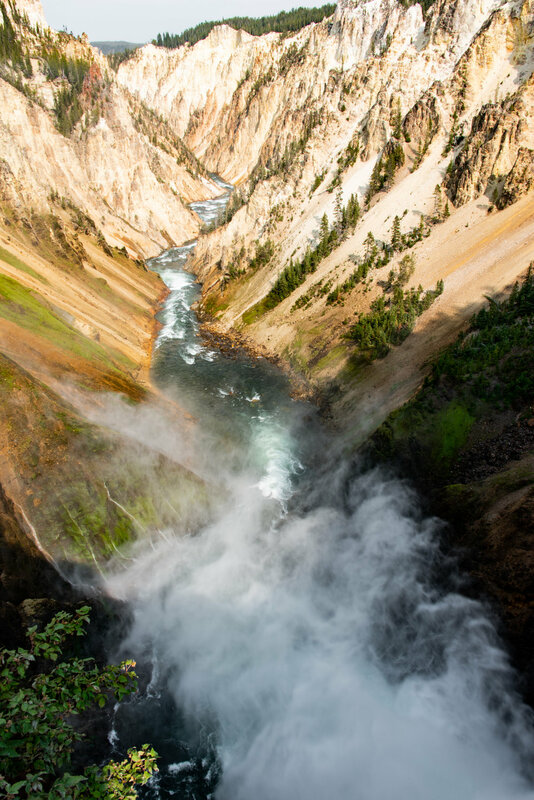 The Yellowstone River carves this canyon, even presenting itself in multiple waterfalls. 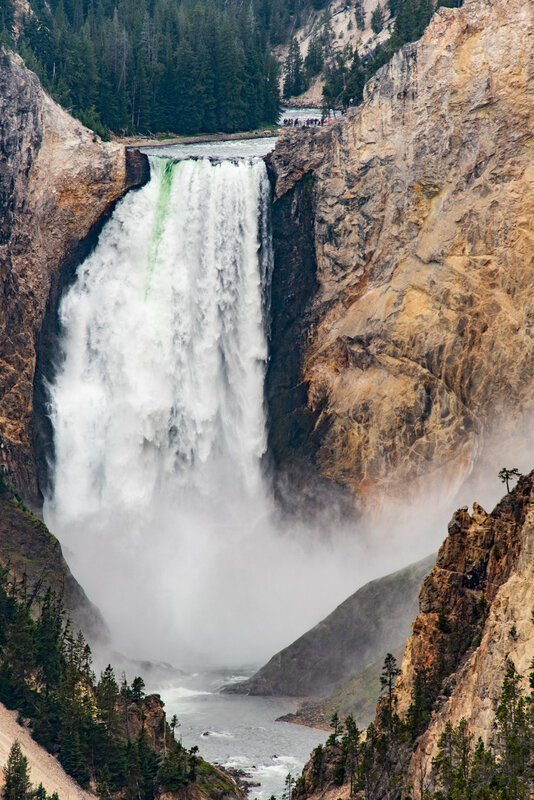 Lower Falls is a dramatic 308 feet, and Upper Falls is a still dramatic 109 feet. Large rocks surround the area of Upper Falls, which are leftover remnants of the volcanic activity that once destroyed and created this area. The colors in the canyon are what caught us by surprise... it is truly beautiful. The brown rock gives way to orange, green, even pink areas that are active hydrothermal features. The canyon was formed by volcanic activity, and that activity - along with wind, water, and even earthquakes - still keeps this canyon in an actively changing environment. This was our first stop to view the river and waterfall. This happens to be the most popular viewpoint, due to a very short and easy walk, and absolutely breathtaking views. Being so popular, this small lookout area was absolutely packed. We basically waited in line, squeezed in for a photo or two, and left. We had a brief moment to stand back and enjoy the view on the lower outlook, which was a bit less crowded. Over all, we did not love the crowded aspect, but the views were really stunning. The colors of the canyon are clearly seen here, and then the river... and then the waterfall. This spot was a lot better to enjoy the river and waterfall. It was not nearly as crowded, and still had some amazing views. This trail is short and takes you almost within reach of an amazing amount of water rushing by at a very high speed. The river comes rushing around a corner, right towards the overlook, then rushes by, and drops over Upper Falls. The water falling is crystal clear and hits the base of the falls in a tornado of mist and power. It’s an amazing feeling to stand close and just above such an amazing display of power from a river. Truly, this is a breathtaking lookout! This trail is much more adventurous - a steep set of switchbacks drops over 600 feet in a short distance. The view at the base of the trail is worth the pain in the knees that it takes to get down there. It is similar to the Upper Falls scene, but you are now standing above the Lower Falls, with the power of Upper Falls pushing towards you. The water in this canyon is so clear, so these waterfalls are really fun to watch. This view gives you a good look at the water, then sets you on a course back up those switchbacks to get back to where you started. It’s a bit of a leg buster, but it’s really not too bad. These viewpoints were both closed for improvements while we were visiting. We would have enjoyed that staircase on Uncle Tom’s Trail, but we’ll just have to plan to cover those two views next time! We really enjoyed the little trails and the amazing views that came with little effort. The Canyon is just as beautiful as the photos imply. After we wandered the area and tried to see every viewpoint that we could, we headed back to camp and took advantage of the showers and laundry! This park has luxury camping to go along with all the other amazing things it let’s us enjoy!